Pastor Violet Little of the Welcome Church and leaders of three other religious organizations have joined in a federal lawsuit challenging the City of Philadelphia’s ban on feeding homeless persons along Benjamin Franklin Parkway. Open-air activities such as the coffee hours following Welcome Church services along the Parkway are necessary “because that’s where the people are, and for so many who choose not to be inside it is the opportunity for relationship,” Little says. According to an article in the June 14 Philadelphia Daily News, the city has agreed not to enforce the ban, which went into effect June 1, pending a hearing July 9 in U.S. District Court. Other organizations joined in the lawsuit include Chosen 300 Ministries, the King’s Jubilee and Philly Restart. 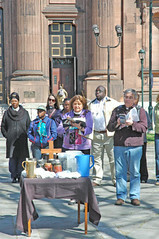 Photo: A 2010 Welcome Church service on the Parkway. Photo by Bob Fisher.